A unique retelling of the life, death and resurrection of Jesus Christ in stripped-down comic book style. A visual storyboard of the life of Jesus. Illustrator Jason Ramasami outlines the gospel message, from the cradle to the cross and the empty tomb, in comic-book style. This unique graphic guide will be perfect for non-booky people of all ages, and particularly teenagers and students. Faithful, fun and imaginative, it gives a fresh, innovative twist to the greatest story ever told. Great for giving away at evangelistic events or as a gift. 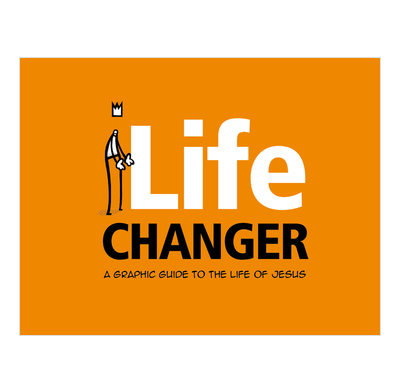 I can't decide whether I think Life Changer is brilliantly simple or simply brilliant. You'll have to read it and decide for yourself. There's so much packed into those lines and shapes that you'll discover more about Jesus however much you already know. Jason Ramasami's visual style has fantastic energy and individuality. The pictures are brilliant, and easy to understand with his clever use of symbols (showing who Jesus is, who's sick or dead, etc. ), and so much fun. The content is very faithful to the Bible, and brings the stories to life in a very engaging way. This is a fantastic book for giving away.